CAN WE SPLIT OUR BOOKING HOURS? We do not split booking hours which is why we offer discounted rates for our 10-hour and 14-hour packages. THE CALENDAR SAYS YOU ARE BOOKED ON THE DATE WE ARE INTERESTED IN, DO YOU HAVE ANOTHER TROLLEY AVAILABLE? We only have one trolley. However, if times of the events work out we may be able to accommodate two events in a day. Please contact us for more information. The trolley, a properly licensed driver, and all fuel that is used during the event. The only thing that is not included is driver gratuity which is at the discretion of the booking party. WHERE DOES YOUR TROLLEY OPERATE? We have done events from Corolla to Rodanthe including Manteo and over the bridge to Sanctuary Vineyards. We are willing to travel anywhere in North Carolina, but travel fees may apply. Please ask for more information. HOW MANY PEOPLE CAN YOUR TROLLEY HOLD? We can seat 40 passengers and have standing room for 10 additional passengers. We prefer to have all passengers seated for longer distance travel. CAN WE DRINK ON THE TROLLEY? Yes. We have For Hire tags so you can bring drinks on the trolley. CAN YOU SERVICE THE 4-WHEEL DRIVE BEACH (CAROVA)? No. We do not service the 4-wheel drive beaches. No. 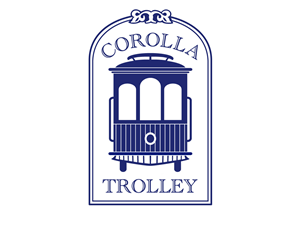 Corolla Trolley is not equipped with a wheelchair lift.